The black characters were given power as opposed to having their power taken away from them for once and it was refreshing. 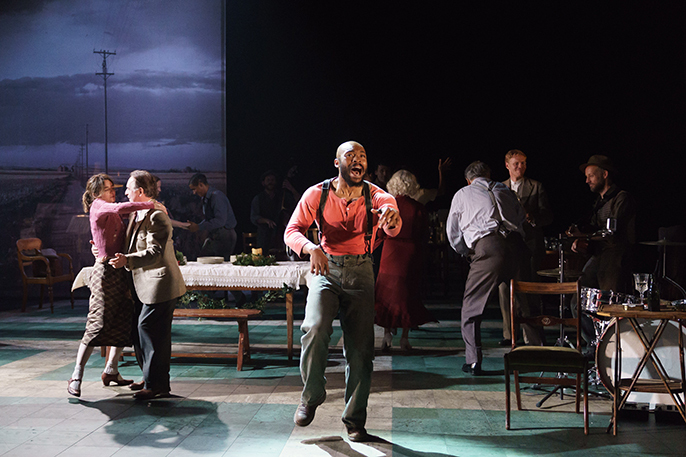 THE GIRL FROM THE NORTH COUNTRY is not so much a musical as it is a play which uses songs to inject power into the story. It is not your standard musical and for this I was truly grateful. For Bob Dylan’s songs are in essence poetry in motion. This play paid homage to one of the most talented and formidable song writers in modern times. Set during the Great 1930s Depression of 1930s in Minnesota, USA, THE GIRL FROM THE NORTH COUNTRY paints a picture of survival and how relationships can strengthen or weaken us during challenging times. The local guesthouse is a hub for the local community and those seeking new opportunities at a time when hope is almost a luxury. The owner of the Guesthouse, Nick Laine (Ciaran Hinds) is trying to keep his business afloat despite being mired in debt and the burden of responsibility weighs down on his very spirit. He wants to do what is right for his family but still reflects the patriarchal atmosphere of the time, taking a lover, Mrs Neilsen (Debbie Kurup) whilst his wife Elizabeth (Shirley Henderson) is in the same house is a symbol of escapism and the one thing he can actual control. Elizabeth is losing her mind but not her spirit and is determined to hold on to that spirit with every fibre of her being. Their son Gene (Sam Reid) on first appearances is a deadbeat waste of space for want of a better expression but his presence in the play is a rally cry to dare to dream, even if those dreams are almost hopeless. His sister Marianne (Sheila Atim) on the other hand is an anomaly, she is pregnant by a mystery man which leaves so many questions left unanswered and yet despite her “predicament” she is the most calm and level headed of them all. It is not until a bible-selling reverend (Finbar Lynch) and a boxer (Arinze Kene) on his way to re-ignite his career arrive at the guesthouse that things quickly unravel and the Laine family and their guests are never the same again. 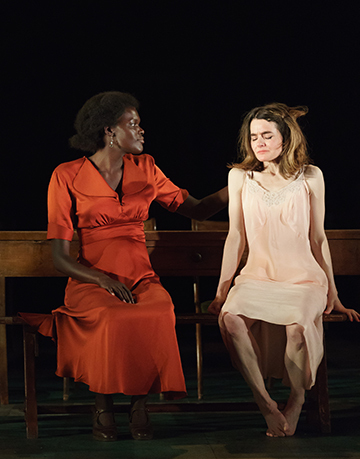 The issues of economic despair, gender roles and race were handled beautifully in this play. What particularly struck me was the way in which race was handled with such nuance. The black characters were given power as opposed to having their power taken away from them for once and it was refreshing. Even when they were undermined they could strike back and to see that played out by Arinze Kene in particular was a welcomed change from the usual narratives of black characters sometimes represented in similar plays set in that era. And whilst gender roles were set, the women themselves each expressed their power in their own way and pulled off the mask of patriarchy – a pointless social construct that did (and still does) more harm than good. I would have perhaps like to see fewer characters in order to get more from each of the strongest characters and go deeper into their storylines, I felt that the ending was slightly rushed towards the end. This is an uncompromising production with magnificent musical performances which bring Dylan’s work to life. It is not simply a “best of” stage compilation, the music complements the script in such a way that it fluidly gives the story so much more depth and essence than if it were a simple stage play. The stage direction and design took us to the time period in which it was set so well. Jack Shalloo’s rendition of “Duquesne Whistle”, Sheila Atim singing “Tight Connection to my Heart” and Shirley Henderson’s rendition of “Forever Young” are just a few of the highlights, there are so many that it is difficult to choose. 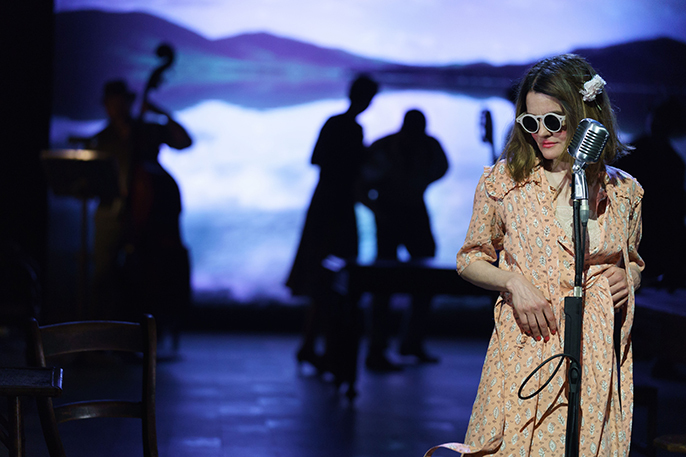 The cast and ensemble were utterly sublime, they sang the entire song list with such gusto and passion that even if you were not a Bob Dylan fan you would become one after seeing this.